A little while ago, the Old Picture of the Day blog posted a picture of FDR taking a ride on an airplane with a caption talking about him being the first president to fly. This seemed strange to me given the time lag between the airplane and FDR's presidency. So, I did a little fact checking. The Internet had a number of unsourced mentions of Calvin Coolidge being the first to fly, but I couldn't find a satisfactory answer, so I wrote to the Forbes Library in Northampton, Massachusetts. Calvin Coolidge is one of my favorite presidents and I've had a delightful exchange of Coolidgiana e-mails with one of their librarians. 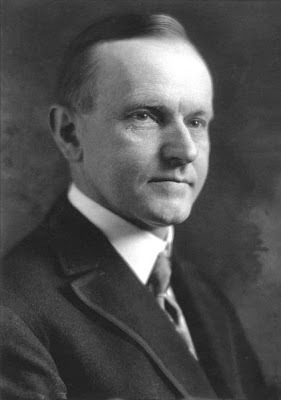 Coolidge was a terrific individual – frugal and stoic, but with a keen sense of wit, a man with simple tastes and common sense. He was known for being publicly quiet and retiring. So much so, that he was even known as "Silent Cal." Today I'm going to share one of my favorite Coolidge anecdotes with you. It is said that when he was Vice President, Coolidge was invited to a fancy dinner party (the kind he abhorred) and a lady sitting next to him decided to draw him out. She turned to the Vice President and said, "You must talk to me Mr. Coolidge. I made a bet with someone and he said I wouldn't be able to get more than three words out of you." Coolidge replied, "You lose," and then remained quiet for the rest of the evening. Calvin Coolidge is our last president never to fly in an airplane. He was invited to fly with Charles Lindbergh but declined; Lindbergh offered First Lady, Grace Coolidge a flight but President Coolidge declined for her. "Silent Cal" is the last president to never drive a car; the last president to travel on horseback to deliver an address. This, in 1927 at the dedication of work about to begin on Mount Rushmore when he coined the phrase "Shrine of Democracy". He is probably the last president who could plow with a team of oxen. He was the first president to acknowledge that he had "Indian" blood. He may have been the first to have any. He was first to broadcast over the radio from the White House. Nicknamed "Silent Cal" yet, thanks to radio, more people heard his voice than the combined voices of all previous presidents. Your Coolidge anecdote is most often rendered: "I've made a five dollar bet I can make you say more than two words." Since 1985 I've performed a solo history Calvin Coolidge: "More Than Two Words". Jim, thanks for commenting. As you are probably aware, Charles Lindbergh's father-in-law, Dwight Morrow, was a former classmate and close friend of Calvin Coolidge, so there's another connection there. The "two words" quote I've seen rendered a number of ways and some think it's apocryphal, but it was repeated on several occasions by members of the Coolidge family a couple of ways, so I believe it happened (or something very close). I just picked one way that I found funny. Some attribute the lady talking to Coolidge as Dorothy Parker, but I don't know if this is true either. Thanks guys for the history lesson. Ughh! I know so little of our countries history and it's past leaders it makes me sick. That's awsome that President Coolidge was the first to transmit radio waves from the White House.